If you are one of those men who long to grow a beautiful healthy beard, but each time you try, you end up with thin or patchy facial hair growth, then finding a great beard growth supplement to improve the thickness and fullness of your beard can help you achieve your goal. So, here is a look at some of the best beard growth supplements for growing facial hair. This ﻿Beard Grow XL Facial Hair Supplement﻿ contains a non-hormonal formula that provides fast acting results for a fuller longer beard. It works on all different beard types and comes with enough tablets for 30 days. 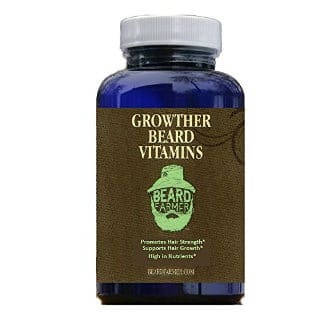 At a closer look, this beard growth booster contains several vitamins such as Vitamins A, B1, B6, B12, C and E as well as other natural ingredients that are known to promote hair and beard growth including Biotin, Niacin, Folic Acid and others. This is a quite popular beard supplement that people have found effective at promoting their beard growth and making it thicker and healthier. Since it contains a large number of vitamins, it is also going to be good for your general health. 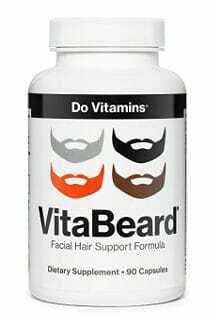 VitaBeard Multi-vitamin supplement is vegan as well as non-GMO, and contains nutrients to help your beard grow. It is 100% safe and drug free, and is made in the USA. This multi-vitamin product comes in 90 capsules and contains all the necessary vitamins to promote health so they can replace your current multi vitamin as well. Some of the ingredients in this formula that are good for beard growth are MSM, Iodine, Vitamin E, PABA, Methionine, Biotin, Inosotol and others. All these components promote cellular generation and repair as well as accelerate hair growth, thicken hair and make it overall healthier. 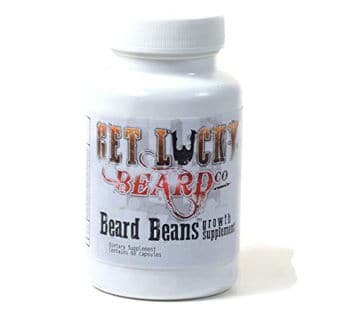 Users notice positive results in growing their beard thicker since consumption of this supplement helps fill in gaps and helps their beard look at a better shape overall. Increase of hair growth also means that you may notice more hair on your body as well. 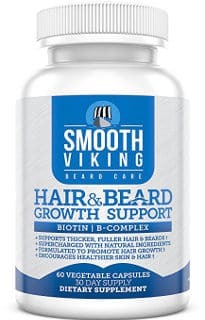 Smooth Viking supplement contains 5000 MCG of Biotin as well as vitamin A and Vitamin C.
This beard growth vitamin supplement fights hair loss and grows beard faster, making it more shiny and healthy looking. It also keeps your scalp hydrated and gives your hair the nutrients it needs for optimum hair growth. In addition, it can help with beard itchiness as well as hair dandruff or scalp irritation while also nourishing the skin and helping it be soft and hydrated. Also, keep in mind that a better hydrated skin is more protected against aging signs. 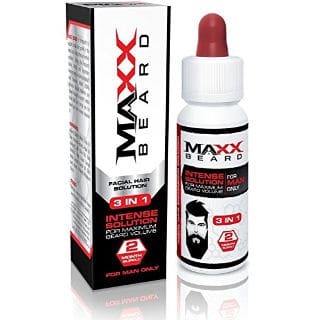 This ﻿Maxx Beard Facial hair Solution﻿ comes in a 2 month supply and with a 100% guarantee. It contains such hair healthy ingredients as Kopyrrol, Biotin, Niacin and other important for facial hair growth nutrients. 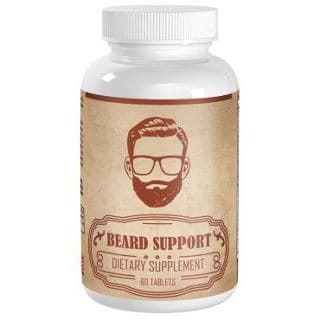 Most users experience better beard growth within 3 months of starting to use these vitamins. This product helps fill in those patchy spots in beards and make mustache thicker. 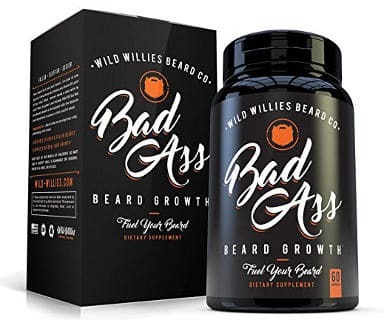 What we like most about this Badass beard growth supplement is that a full list of ingredients is available with the exact percentage of each ingredient included. 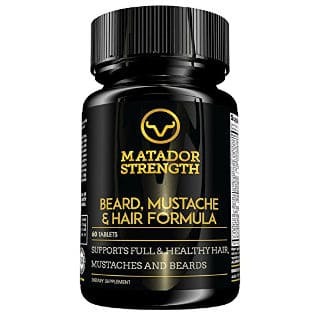 A large number of vitamins together with natural beard growth components such as MSM, BioSitol Complex 1, Zinc and Copper, as well as non-hormonal vegan ingredients make this supplement safe for consumption and actually healthy. 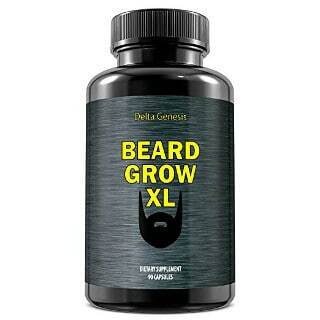 According to the company, it will not only promote thick beard and moustache growth fast but this nutrient packed supplement will reduce itchiness and make skin soft. It also helps to improve energy levels and most users are very satisfied with their purchase. 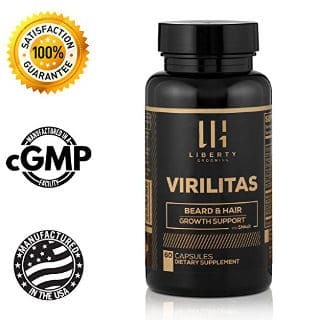 Key ingredients of this Virlitas beard and hair growth supplement are vitamins B12, C, D, E and other important nutrients for healthy beard growth such as Biotin, Beta Carotene and Zinc. It also contains Cysteine, a sulfur that contains amino acid and promotes strong beard hair, as well as Shilajit, a natural ingredient that is said to increase testosterone levels and therefore boost hair growth. The company recommends using this product for 30 days in order to start noticing results. It also contains an animal derived gelatin and therefore it is not suitable for vegans. Finally, it comes with a 100% guarantee, and most users have experienced positive results when taking it. This beard, mustache and hair formula contains several vitamins as well as other natural and boosting beard and hair growth ingredients such as Biotin, Niacinamide, Folic Acid, Zinc, Calcium, Copper, green tea leaf extract and others. It is free of gluten, soy, caffeine or any dairy and is made in the USA. It also comes with a 100% money back guarantee. According to the company, this multivitamin beard growth supplement is formulated to grow fuller healthier beards and keep both your beard and skin hydrated, adding shine to your facial hair. It also prevents flaking. Overall, users are very pleased with the results of this product. Reborn Labs supplement for beard growth comes with a 60 capsule supply and is formulated to grow a fuller, thicker beard. 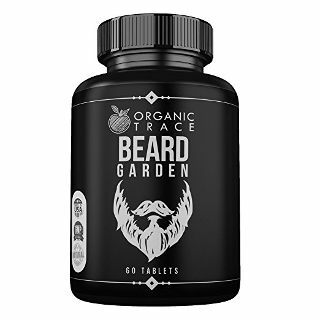 It contains over 25 beard growth vitamins and other ingredients such as Biotin, Magnesium, Zinc, PABA and Spirulina. As well as growing a healthier fuller beard, these vitamins also keep the skin under the beard healthier and softer. They come with a 100% guarantee and it is good to know that part of the company’s profits are donated for good charity causes. Most users like this product and enjoy the results they had been wishing for. Made in the USA, these Beard Farmer Vitamins are high in important nutrients that support beard growth such as folic acid, biotin, niacin, calcium, iron, magnesium, and zinc. They come with 90 tablets. Since this product contains Betaine hydrochloride, the company warns that it should not be consumed by people suffering from peptic ulcers or any other medical condition linked to excess acidity. Overall, some users are very pleased with this product’s effectiveness while some others have not experienced the results they were looking for. This Beard Support Dietary supplement does not only help with beard growth but also promises to stop hair loss in a natural way. The company suggests that they can’t reveal the full list of this product´s ingredients which is something that, personally, it does not make any sense since the customers have the right to know exactly what is included in a product before they start swallowing and especially if they suffer from allergies or any medical conditions. Nevertheless, the company mentions some ingredients that their product has without revealing their secret formula as they say. In addition, this product comes in 60 capsules and is made in the USA. It is said to start working in as little as 2 weeks. 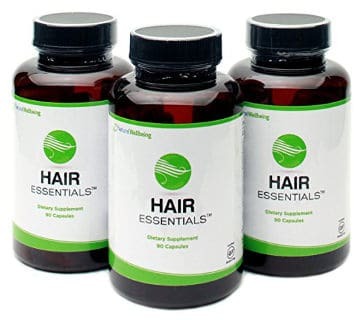 Hair Essentials Supplement is a hair growth supplement and therefore it can also help in growing a fuller and healthier beard. It is doctor formulated, contains 90 capsules and comes with a 90 day money back guarantee. It lowers DHT and contains nutrients to prevent hair loss, help the hair grow and support scalp circulation. If you are suffering from hair loss but also want a supplement for beard growth, you can try this out, otherwise it is better to go for a supplement that is exclusively formulated for beard hair growth. This Beard Garden Beard, hair and mustache supplement contains all natural ingredients. It helps beards and mustaches grow while also fighting the itchiness and flakiness of your beard. It is also good for hair loss problems.It containsB complex Vitamins, other vitamins such as A, C and E as well as 5000 mcg of Biotin. Other beneficial for beard growth ingredients are Calcium, Zinc, Selenium, Copper, MSM and others. This product contains 60 capsules, it is made in the USA and comes with a 100% money back guarantee. This beard growth kit comes with both a beard supplement and an unscented natural beard oil, and is formulated for faster beard growth, resulting in smoother and cleaner skin. It contains 5000 mcg Biotin and is made in the USA using natural ingredients.The beard oil contains both Argan Oil and Jojoba oil for softer and shining beards. This kit comes with an unconditional 30 day guarantee. 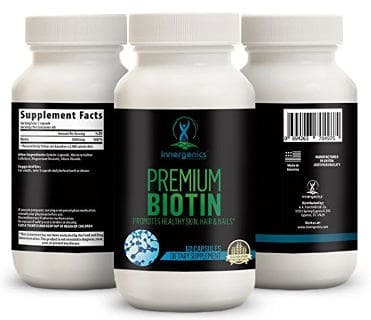 This biotin hair & beard growth supplement, selling at a very cheap price, contains 5000 mcg of Biotin. It is formulated to boost both beard and hair growth but it is also good for strengthening nails. It is gluten free and is made in the USA.It also comes with a 30 day risk-free guarantee. 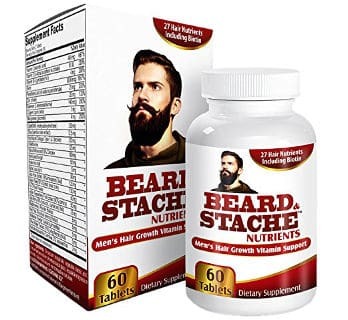 This ﻿beard and stache supplement﻿ comes in a 2 month supply and contains 28 powerful nutrients including biotin, B vitamins as well as vitamin C and E, Zinc, MSM and others.Users are told to take 2 tablets daily, which provides the necessary vitamins and nutrients that are missing from a normal diet. 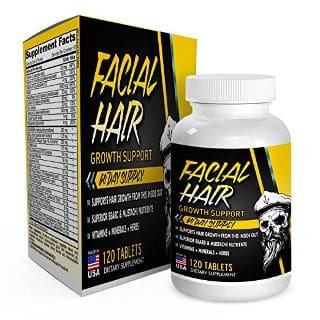 Some users like that after taking this supplement, they are growing facial hair in areas that they couldn´t before as well as the fact that their beard looks fuller and thicker. Nevertheless, not everybody has experienced the same positive results. 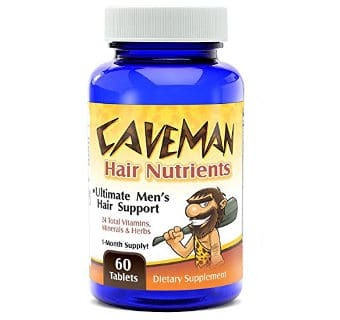 Although the cavemen of the past lacked important nutrients in their daily diet, the caveman on the bottle of this hair and beard growth supplement promises a vitamin boost with many vitamins and other hair growth important nutrients. This product works for both hair and beard growth and according to the company, it works best when you take 2 tablets daily. It also comes with a 100% money back guarantee. 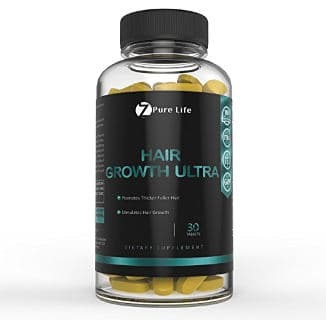 This Hair growth supplement contains lots of the same ingredients that are found in beard growth supplements and that is the reason why we included it in this review. It comes in a 30 count container, is made in the USA and is followed by a 100% money back guarantee. In addition, it contains DHT blockers to help prevent hair loss as well as other beard healthy ingredients such as Vitamins, Biotin, Folic Acid, Copper and others. Apart from its hair health benefits including helping with dandruff and scalp itchiness, this product also helps the skin both of your face and your scalp stay hydrated as well as your face to feel smooth and soft. Although not with the best user reviews, this beard growth supplement comes with a 100% money back guarantee. It comes with 120 tablets, which is a two month supply, and contains some good natural ingredients which promote hair growth. It is made in the USA. Something that is worthwhile noting though is that although it is stated on the bottle that it contains 120 tablets which are enough for a 2 month supply, in the more details section that follows, it is mentioned that each bottle comes with a 60-day supply. In this case, someone may guess that there must be a mistake in the second description. This Beard Growth Supplement is made with some nutrients that help provide better hair growth. 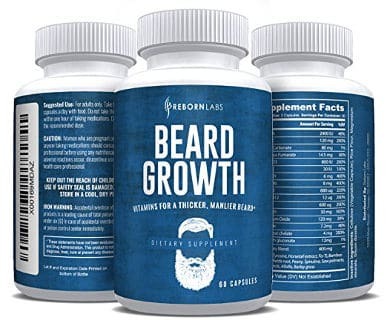 It comes in 60 easy to swallow capsules and, according to the company, it results in less shedding and better beard health. Unfortunately, there is little information about this product´s features including a full list of ingredients, and even fewer user reviews. 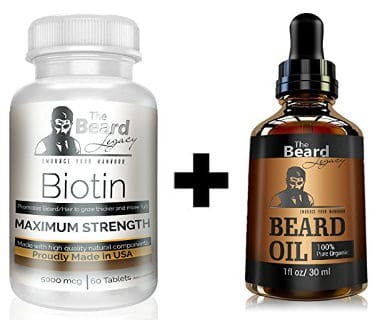 All in all, if you want to boost your beard and mustache hair growth, the best beard growth supplements in this review offer you an effective way to achieve your goal but can also provide you with some additional health benefits that can be very much appreciated.